More than 200 campaigners fighting for public access to one of Dartmoor's most famous landmarks gathered to protest at the site for it to be reopened. 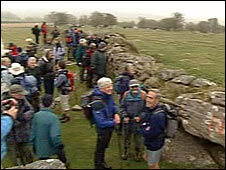 Access to Vixen Tor was ended by its current owner, Mary Alford, in 2003. It had been open to the public for 30 years, but Mrs Alford said she feared being held liable for accidents. She said there never was any official agreement for public access. Campaigners say they will keep up the pressure for it to be reopened. The Ramblers' Association said the turnout during the protest on Sunday was "absolutely fantastic". Kate Ashbrook of the association said: "It just shows how much people want the freedom on Vixen Tor." Mary Alford said as well as liability concerns, she wanted to ensure the safety and wellbeing of the animals on her farm. She said that there never was a public footpath to the Tor, merely an access agreement between the previous landowners and Dartmoor National Park. She said that, in the meantime, it was private land and her family wanted to keep it that way. The fight to gain access to the Tor has been constant since it was closed off. Previous actions, including mass trespasses and the attempted invocation of Right to Roam legislation, have failed. Lawyers advised the National Parks Authority, which has responsibility for Dartmoor, that a compulsory purchase order was also likely to fail. 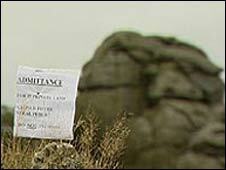 Ramblers are now pinning their hopes on a series of Rights of Way claims presented to Devon County Council last week. However, it could be months before a decision is made.